Forget problematic forms, late deadlines, and how upset Aston Villa fans may be. Andrei Arshavin has finally joined Arsenal after a long and tedious transfer negotiations, and having arrived at the Emirates the Russian playmaker has spoken to Arsenal TV about joining the Gunners. Noticeably, Arshavin’s English skills are hugely impressive, particularly when compared to the non-existent English of his fellow countryman in the Premier League, Roman Pavlyuchenko. This should make acclimatising in North London much easier for Arshavin and he is able to overcome the communication barrier. Arshavin said that he “believes in his teammates” at Arsenal that they can win a trophy this season, and that he should be fit within a week. Arshavin also called Arsene Wenger “my man during this deal” while commenting that the weather in London over the last few days has been exactly the same as in St. Petersburg. Andrei Arshhavin’s debut interview can be seen here. I have agood feeling for this, really good interview in English, he must be an intelligent bloke on and off the pitch, typical Wenger signing in that respect. cany wait for him to settle in with Eduardo,fab and RVP. 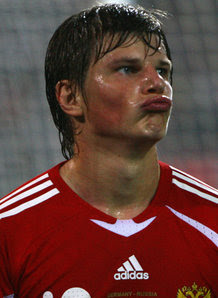 I, like most other Gooners, am extrememly excited with the prospect of Arshavin; My only concern is our strikers playing alongside AA, will need to raise their game, especially Ade; cos AA is gonna create more goals scoring opportunies for others, and we continue with our poor finishing then … what was the use!